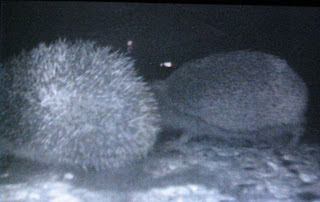 With the ducks having left home, we are now enjoying watching some nocturnal visitors to the garden. Last year we saw loads of hedgehogs around, so we put out some shelters for them to hibernate in over winter. 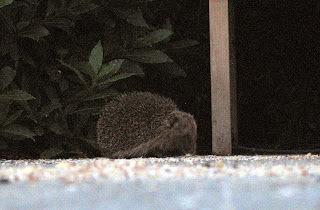 They are now back again, and this year we're ready for them with a camera! The first was taken about 9:30 the other evening, so was a bit dark. A bit of photoshop editing has brought the light level up by quite a bit. The second is a picture of the TV, showing the live feed from the camera we've got set up by the food - hopefully there'll be more images to come.